We’re delighted to announce that our new mobile apps for iOS and Android are here! Designed to bring the efficiency and innovation of inniAccounts right to your pocket. Our apps let you see every aspect of your business at a glance; so you never miss a trick. With your finances available in real-time and at your fingertips, you can make instant decisions whenever and wherever you need to. Here at inni, we understand that most contractors and freelancers spend a lot of their time out and about. Through the use of award-winning software and pro-active expert advice, our aim has always been to not only remove the hassle of our client’s admin but to ensure they have a live view of their business whenever they need it. With inniAccounts it takes as little as 7 minutes a week to keep your finances up to date, and our iOS and Android apps have streamlined this even further. Our clients will now be able to take advantage of that time commuting, or grabbing a quick caffeine fix in-between meetings, to complete their daily admin in a matter of seconds. If you’re an Android or iOS mobile user, you can download the inniAccounts app to manage your accounts while you’re on the go. Our apps are free for all our clients and can be downloaded from the Play and Apple stores. Not a client but fancy a look? Why not give our interactive demo a try and see how our software could be helping you. Our development team have been tirelessly working to build a dedicated, streamlined experience for our clients. We think they’ve done a fantastic job. The majority of accountancy services point their clients towards third-party apps, which usually involve additional costs, a disjointed experience and customer frustration. Here at inniAccounts, we’ve worked to develop a singular, seamless solution across all devices. Our apps are specifically tailored for contractors, consultants and freelancers; just like every other part of our business. We’ve designed from the ground up and all in-house to meet our client’s needs. Our client’s influence our development roadmap, they helped us beta test the apps, and we’ve been running with their feedback. We think the result is a focused, sleek product. Plus, there’s no extra costs or hidden fees buried anywhere. Want to know more about the ins and out of our App? Take a look at our handy Knowledge Hub guide. 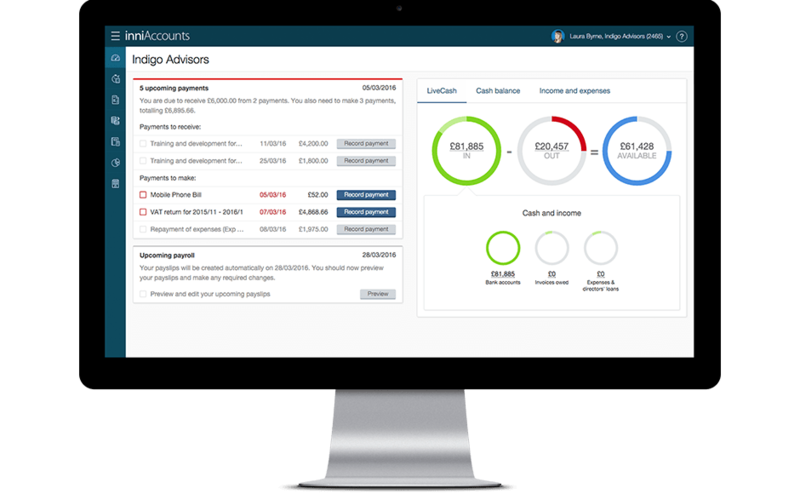 We’ve designed our apps to take the fuss out of business admin and accounts and to enable our clients to confidently make decisions with a live view of their finances; wherever their work takes them. We’re thrilled with the result, but that doesn’t mean we’re through yet. We’ll continuously be innovating from here on out. Every update (which will always be free), will let our clients benefit from the latest technology. Want to give it a try? Take an in-depth look at our software here.